Active File Compare is an advanced utility for the comparison and synchronization of any text files in visual mode, it reports the results of the comparison in two side-by-side windows on the screen. 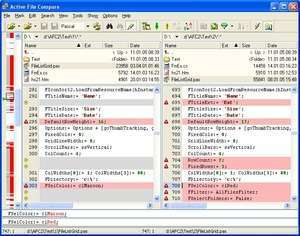 This utility is an excellent tool for comparing source code versions since Active File Compare provides you the ability to correct the source code and also supports syntax highlighting for the programming languages C , Java, Visual Basic, Delphi, Object Pascal, SQL, Perl, Assembler, Fortran, Foxpro etc. and for HTML, PHP, XML, INI and BAT files. You can also use it to manage the source code when several independent authors make changes. Active File Compare 2.0 is a shareware program and can be used as a demo to try the software until the free trial period has ended. A full version of the program is available after the trial period ends. For security reasons, you should also check out the Active File Compare download at LO4D.com which includes virus and malware tests. Additional screenshots of this application download may be available, too.